In business, there is nothing more exciting than seeing the impact or growth that a new campaign generates. Whether the goals are engagement, sales, or lead generation, the excitement still translates. However, how are you to measure the results if there aren’t any factors to test against? Well, that’s where control groups comes into to play. In science, a control group is a term commonly used to describe subjects that receive zero exposure to certain factors. In digital marketing, we use it to describe segments of traffic that receive zero exposure to specific campaigns or messaging. The most common control is a 50 / 50 split, where 50% of site traffic sees the campaign and the other 50% (the control) does not. 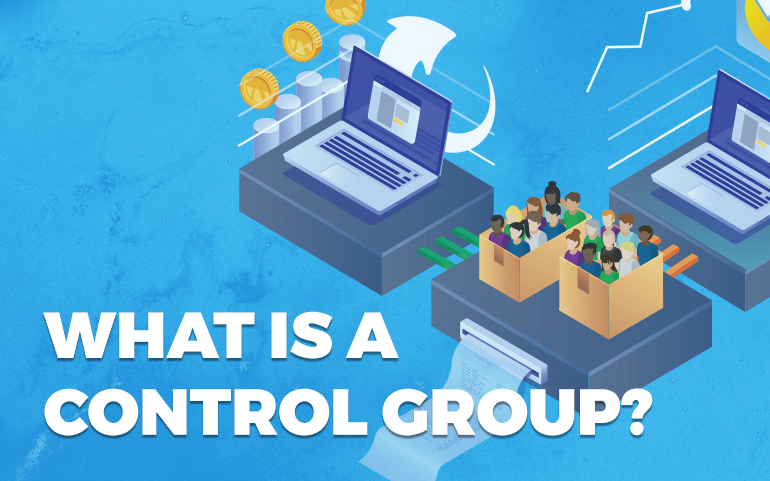 How are control groups helpful to business? A control group isn’t just helpful, it is often a vital part of business and marketing strategies. A successful control group will provide campaign managers with two pieces of information: how the campaign is impacting the bottom line and how campaign variables (i.e. different offers, messaging, discounts) are impacting user behavior. Some of the biggest decisions in business are often made using the data gathered from these tests. What data can be gathered from a control group? Aside from standard insights, such as engagements and interactions, control groups show campaign managers how well certain variables are driving sales, boosting conversions, and increasing average order value. Is a 50 / 50 split the only control group possible? Not at all. While a 50/50 split is the most common control amongst marketers, it is by no means the only possibility. Control groups can be broken down into numerous variations, such a 80/20 or 40/60, it all just depends on what the goals of a campaign are. Additionally, controls groups can test different onsite variables, such as time of day, traffic source, and date range. The possibilities are truly endless with the right technology. However, many plugins don’t allow high levels of customization outside of 50/50 splits, so finding a business that provides the level of technology your campaigns need is crucial in order to test controls against more advanced site variables. What are some of the more advanced site variables control groups can test against? When campaign managers desire to test different variables outside of standard traffic, it becomes a little more fun and a lot more interesting. While plugins aren’t able to provide intricate levels of customization, UpSellit is able to provide endless segments to test and experiment with. Factors such as geolocation, date range, time of site, time of day, and anything else you can imagine all become possible to test against. When the right technology is available, the most advanced controls become possible to create. If I don’t use a plugin, how can I be sure the reporting is accurate? Some control groups, such as those provided by UpSellit, have the ability to integrate with third party analytics engines to show campaign managers side-by-side performance metrics of sites with and without certain variables. This third-party compatibility is lucrative, as it removes the mystery around reporting accuracy and puts controls back in the hands of campaign managers. Outside of being able to trust the analytics, working with a provider adds the human element that most plugins lack, especially when it comes to questions, concerns, and customization. Control groups serve campaign managers well in tracking sales performance and proving incrementality for specific campaign variables. With the support of advanced targeting, trustworthy analytics, and third party integrations, the possibilities are endless. UpSellit’s control groups offer all the features listed in this article, as well as some most marketers never thought possible for their campaigns. Interested in learning more about what UpSellit has to offer? Contact hello@upsellit.com and speak to one of our Conversion Experts today.